Last year it was the Cara Brow, this year it’s the Under Brow. 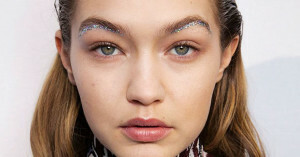 Even eyebrows have trends! But whether you’re on trend, or just keeping the strays at bay, here are our best brow tips for you. At home, tweezing is the most precise way to shape brows, and is the best way to maintain them between professional appointments. It is very easy to overdo it, so try to limit your DIY sessions to once every two to three weeks. Using a magnifying mirror can actually work against you, as you lose perspective and are more likely to over pluck. It’s best to outline your brow shape first with a brow or highlighter pencil, and then pluck only the hairs that fall outside that line. Just a little off the sides please! To avoid the unibrow look, many people tend to over pluck the space between their brows. That larger space can make your eyes look too far apart and your nose look bigger. For most of us, the beginning of the brow should line up with the bridge of your nose, not the outer edge of your nostril. To determine where your brow should end, imagine a diagonal line from the corner of your nose to the outside corner of your eye. It may help to use a pencil as a visual guide. How to achieve a golden arch? Too severe of an arch will leave you looking perpetually surprised. Find your natural arch by looking for your eyebrow’s highest point, normally about two-thirds of the way from the inside of your brow (it’s not supposed to be perfectly centered). Tweeze below the brow to create a lift. Again, do not over pluck. Thick and polished trumps thick and messy, so don’t forget the top of your brow. Stray hairs are more noticeable up there. And if you’re trying for thick but are a little spare on hairs, don’t despair, and don’t overdo the eyebrow pencil. It typically takes three months for your brows to grow in. While you are waiting, you can use a brow pencil that’s not too waxy, and lightly trace along the outline before blending it in. You can also try an eyebrow growth serum to help them along. The best thing you can do for your brows? See a professional, even if it’s only once or twice a year. At Privy Skin Care, we can help you find the natural shape of your brow and give you helpful guidelines for your at-home routine.